Astronomers have been puzzled as to why they could not detect the cold, star-forming gas, hydrogen, in the most distant, older, regions of the Universe. At such vast look-back times, astronomers expected the gas to be much more abundant as it has yet to be consumed by star formation. 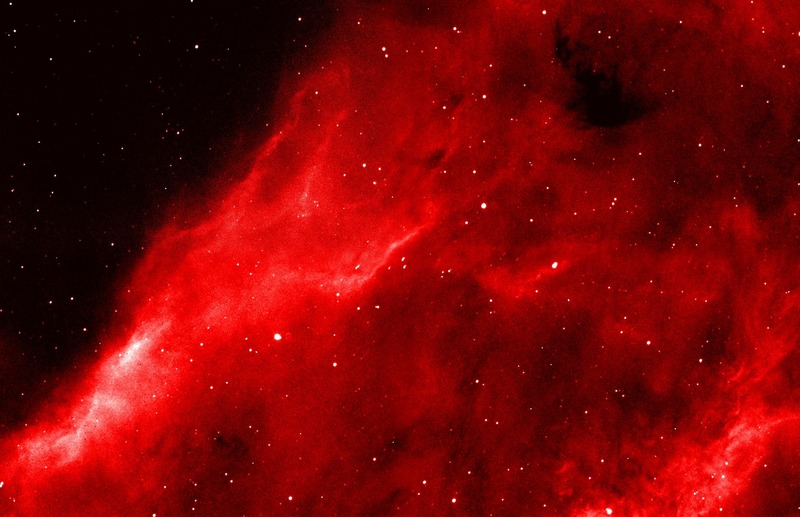 The image above is a portion of a massive hydrogen gas cloud, floating through the cosmos. This concentration of superheated hydrogen and microscopic carbon dust particles are simultaneously the leftovers from past supernovas and usually the beginning of new stars. As the ionized hydrogen cools, its atoms combine to make hydrogen molecules, or molecular gas clouds. These clouds are the coolest collections of gas in the universe, and have a temperature of just a few degrees above absolute zero. Eventually the hydrogen and dust will compress enough to become a new star, unless, as in the case of the early, ancient universe, new reserach shows, a supermassive black hole happens to lurking nearby. Dr Stephen Curran, from the University of Sydney‘s School of Physics and CAASTRO – the ARC Center for All-sky Astrophysics – and Dr Matthew Whiting, from CSIRO Astronomy and Space Science, have addressed this problem by devising a model that shows how the supermassive black hole, lurking within the center of each active galaxy, is able to ionise all of the surrounding gas even in the very largest starless galaxies. When hydrogen gas is in this state, where the electron is ripped out of the atom, the gas it too agitated to allow the cloud to collapse and form stars. Also, when ionised, it cannot be detected through radio waves at 21-centimeters – the way cold star-forming gas is normally found. The new research shows that the extreme ultra-violet radiation given off by the material being sucked in – at near light-speeds – to the black hole, is sufficient to ionise all of the gas in even the very largest galaxies. “In order to probe further back in time, we choose the most distant radio sources. What appears as faint light from these, to us on Earth, is actually extreme ultra-violet, dimmed and stretched (redshifted) to visible light on its several billion year journey to us,” explained Dr Curran. “Unfortunately, these are the only objects we know of at the very limits of the cosmos and within these the radiation from the central black hole is so intense as to heat all the gas to the point where it cannot form stars. We have shown that rather than being a telescope sensitivity issue, all of the billions of suns worth of gas is indeed ionised. This means that even the Square Kilometer Array – the biggest radio telescope, which is currently being built in Australia, New Zealand and southern Africa – will not be able to detect star-forming gas in these galaxies,” said Dr Curran. “The Square Kilometer Array will excel, however, in detecting very cold gas that is too faint to be detected by optical telescopes, which must have existed to give us the stars and galaxies we see today,” he added.